Fieldtype which generates the options for a Select Inputfield from any table of any (accessible) database. Define the source table, columns (to pull value & label) and the preferred Inputfieldtype (Select, Radios, Checkboxes SelectMultiple or ASMSelect) in field settings. Access to all values in the corresponding row of the source table via API. Frontend safe. Fieldtype which generates the options for a Select Inputfield from any table in any (accessible) database not only PW-Tables or PW-Fields. Define the source table, columns (to pull value & label) and the preferred Inputfieldtype (Select, Radios, Checkboxes SelectMultiple or ASMSelect) in field settings. Access to all values in the corresponding row of the source table via API. Frontend safe. Step 1: Create a new field select fieldtype SelectExtOption. Fieldtype SelectExtOption is compatible with the following Inputfieldtypes. You maybe need to adapt InputfieldPage to make all the options available. note: InputfieldAsmSelect selections are sortable. 3d party modules maybe supported too. Have a look here: Developers Note. 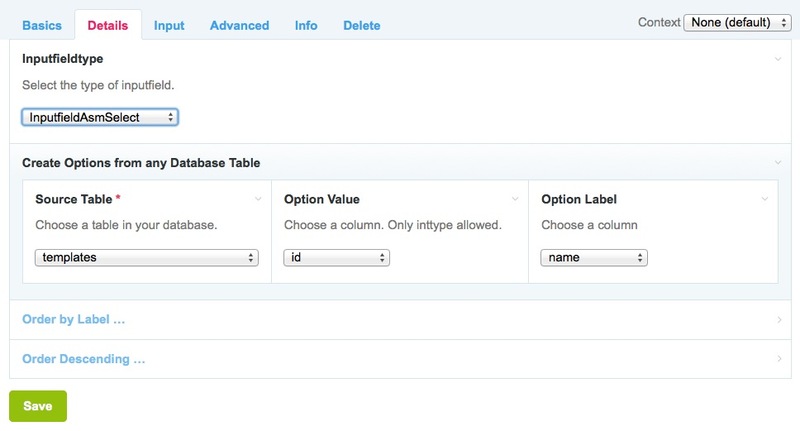 Choose any datatable in the database including those which are not depending to Processwire. required. Select a column of the source datatable to get the value for the option tag. Default column or column if not selected is always the first column of the table. Select a column of the source datatable to get the label for the option tag. All types allowed. Default label or label if not selected same as Option Value. Small Filter to limit the options if needed. Adds a WHERE condition to the SELECT statementwhich pulls the options from the datatable. Function filter() is hookable. Options are ordered by Option Label. Select to order by any other column. All column values are populated as a property (columnname) except values of columns named with reserved words ('label', 'value', 'row', 'options' and 'data'). Function row() will return a MultipleArray with the stored value as key. 3d party Inputfieldtypes are supported too, if they are subclasses of InputfieldSelect. Furthermore they should be added in settings of InputfieldPage module. No guarantees that these Inputfieldtypes will work as expected. filter() returns the WHERE clause which will be added to the SELECT command. You can specify more than one condition using AND or OR operators.